Santa Anna Hunting Area (SAHA) is a family run quality hunting preserve dedicated to give a hunting experience unrivaled in Texas and the great southwest. Gerry and Eldena Stearns run the day to day operations on the section size preserve (600 plus acres) which include: Pheasant, Chuckar and Quail hunts. With all our hunts, there is no limit. All hunts include: dogs, dog handlers, bird cleaning, packaging and ice. All you’ll need is to bring is an ice chest, plenty of shot-shells and a shotgun. Wish to bring your own dog? We have birds. Call for details. 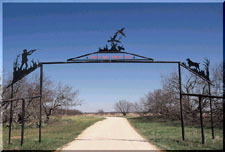 Texas residents are required to have a valid Texas hunting license. 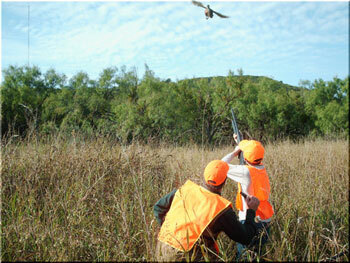 Out of state hunters are required to have a special branded bird license. Customizations available on 1/2 day hunts. Reservations and deposits required to guarantee your hunt time. Eldena and I appreciate the gratuities given our dog handlers and the game cleaners. We feel that 20% is adaquate. No shooting birds on the ground. No drinking alcoholic beverages in the field. No shooting birds before or after scheduled hunt. On day of hunt payment is due for number booked without prior notice. Gratuities for dog handlers and bird cleaners are appreciated. ONE OF THE MOST IMPORTANT RULES IS TO HAVE FUN SAFELY! !